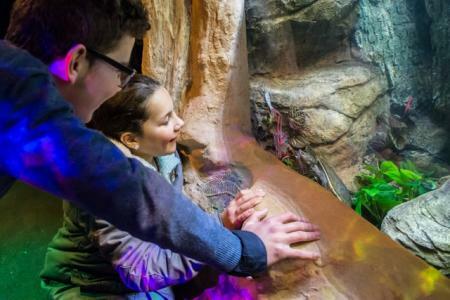 Watch sharks and turtles swim over your head, touch a starfish, come face-to-face with a ray and count terrapins as they walk through a rainforest... there's an under-sea world to discover at SEA LIFE Brighton, and the new Jurassic Seas exhibition takes you back to the age of the dinosaurs, too. We offer a review of what's on offer for parents and primary-school children. Elena Dalrymple took her children Tom and Emily (aged 4 and 8) to SEA LIFE in Brighton. 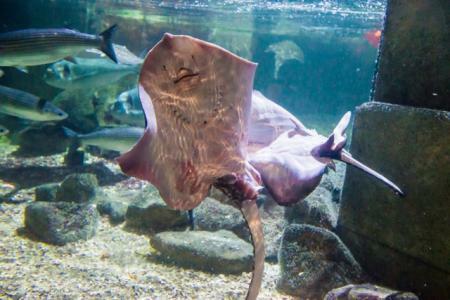 Located right on the beach on Marine Parade in the centre of Brighton, SEA LIFE is a hugely popular seafront attraction. 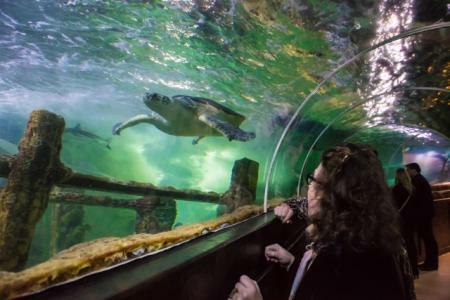 The world's oldest operating aquarium offers everything from 'traditional' tank-watching in the Victorian arcade to hands-on rockpool exploration and new, interactive digital displays in the Jurassic Seas exhibition. Little ones might be a little overwhelmed by the scale of what's on offer, but getting to touch a crab or a starfish in the rockpool is very memorable! My daughter was also fascinated by the rays in the ray pool and loved standing right up next to the tank to look at their faces, and mesmerised by the turtles and sharks swimming above her in the Ocean Tunnel (expect to spend a long time standing in the tunnel looking up... and to enjoy every minute!). The free Dive Log Book you receive as you enter SEA LIFE is a great way to organise your visit: look for stamping machines as you walk around and collect all the stamps to receive a reward, as well as learning plenty of marine facts and figures. Also popular is the Rainforest Adventure section of the aquarium, complete with 'mangrove roots' entry for kids. The terrapins are wonderful to watch, and kids are always interested in super-scary creatures (in this case poison-dart frogs and piranhas). The new Jurassic Seas exhibition was a huge hit with my eight year old (digital dinosaurs you can interact with? Which way?). 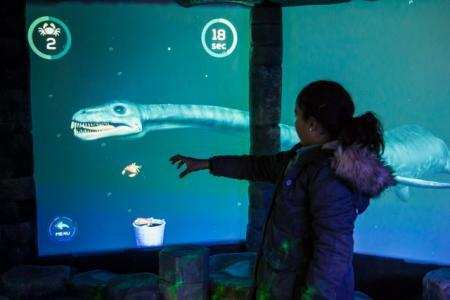 Motion-sensor technology brings aquatic creatures of the past 'back to life' on huge screens, so you can 'feed' a Plesiosaurus, examine a Megalodon's giant teeth and test your bravery in the face of an angry Liopleurodon. Equally impressive (to parents, anyway!) 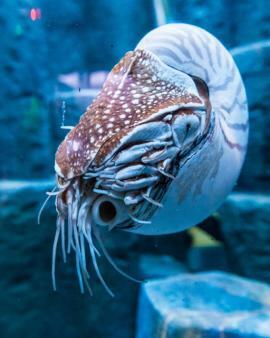 are the array of live creatures that have survived for millions of years; you can see a Giant Nautilus, some lively Mudskippers and the weird but wonderful Horseshoe Crabs. There are loads of feed-time shows to attend throughout the day. 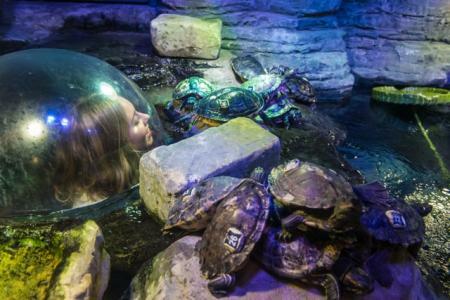 SEA LIFE entry tickets are valid for the whole day, so you can nip out for lunch and come back to watch the turtles or sharks eating theirs, or head to the seahorse tanks or the ray pool to understand more about different creatures and their habits. Available for an extra fee are tickets to a Behind the Scenes Tour which explains how filtration and water quality systems work, how food is prepared for the animals and gives guided access to breeding and research areas and a ride on a Glass-Bottomed Boat, for a snorkeller's view of the turtles and sharks in the Ocean Tank. There's a cafe serving hot and cold drinks, snacks, sandwiches and cakes inside the SEA LIFE complex, or head out to the beach for fish and chips and then return to finish your visit after some fresh air. SEA LIFE Brighton is right next to Brighton Pier, with lots of public transport options available. The closest car park, NCP, is under the Thistle Hotel, a short walk from the entrance. Open from 10am - 5pm daily (10am - 6pm during school holidays). Last admission is 1 hour before closing time. Closed on Christmas Day. Tickets start at £17.50 per person (under 3s are free) on the door, with savings of up to 30% available online. The on-site shop sells a large selection of gifts. We loved the fossilised shark teeth (£2.50) and ammonites (£2.60). A guide to the marine creatures in the aquarium is available online and offers basic facts and images. Learning about sea life, vulnerable species and the evolution of marine creatures is part of science and geography lessons in primary school.